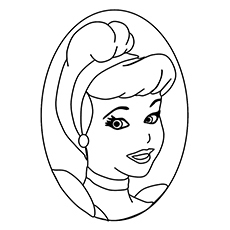 If you are giving your kids coloring pages based on the theme of Cinderella, the best way is to start by introducing her character. 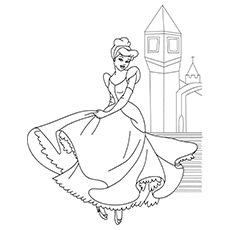 Since the picture has only the complete profile of Cinderella drawn in line work, it is easier for the kids to color her well and enjoy the story as well. 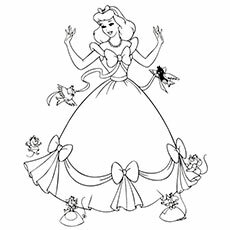 Girls especially love to color such lovely Cinderella coloring sheets, as they themselves love dolling up and looking good. 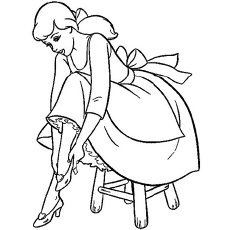 Also, this picture will be helpful in emphasizing the character of Cinderella on the young minds. 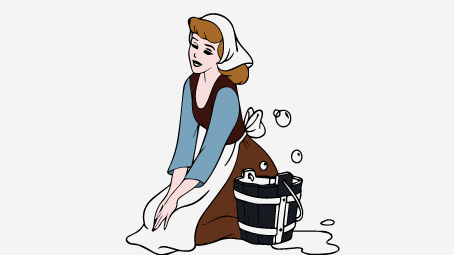 The expressions of unhappiness and the overall dress up shows the way she looks while serving as a servant to her family. This is one way of letting the children know the difference between a happy picture of a character (Cinderella profile above) and a picture with subdued effect. 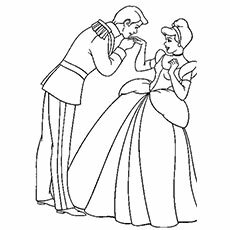 Telling your kids the Cinderella story if they do not know it already will create more affinity towards the character in their minds. 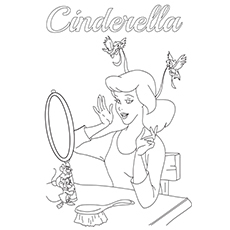 Young kids will get the experience of coloring Cinderella in a different mood, pose and look. 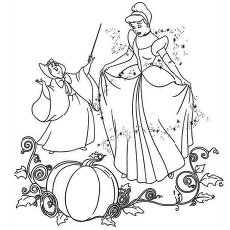 Coloring this sheet will be an altogether different experience for your tiny tot as she will relate to the soft toned character of Cinderella. 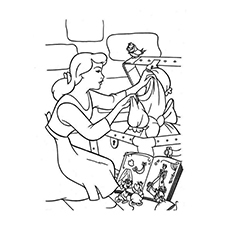 This picture has many intricate details that will further create more interest in your child about the story of Cinderella. 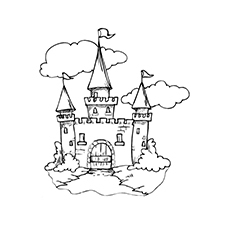 You can introduce your child to different shapes and also give him an idea about how to draw and color a castle in the simplest possible way. Since the picture does not carry any intricate designs of windows and doors, the child will be able to color it block by block. This picture shows all the three dressed in festive attire with caps. This is the picture when the mice visit the party of the Prince serving as horses to the chariot and are transformed back to their original state when the clock strikes 12 in the midnight. Both these figures are quite simple and their entire attire is also simple. That is why, this coloring page is perfectly suited to kids who are starting with their color pencils and crayons and are yet to gain efficiency in coloring within the lines. This picture depicts her trying to find out a proper dress from her trunk that can be suitable for the party. 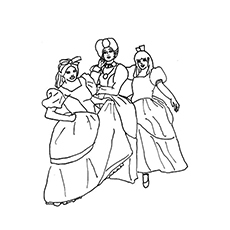 The coloring page explicitly reveals the anxiety and anxiousness of Cinderella to get to the party and find out the right dress. 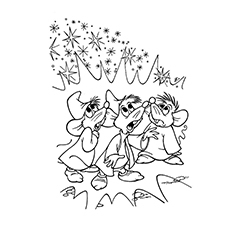 Children are fascinated with magic, and this sketch is sure to hook your child to coloring. 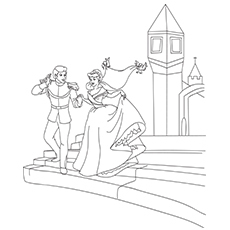 Cinderella and the fairy godmother are seen in the coloring page each with different expressions. 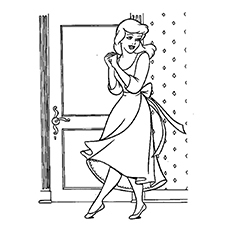 Coloring this page will give the children an idea about how to color characters in different moods. Children love fantasies and marvel at miracles and magical things. 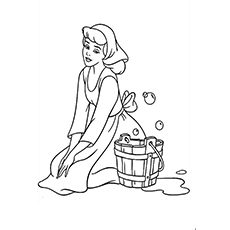 By giving this coloring page to your child for coloring, you are offering him a chance to color things he imagines and dream. 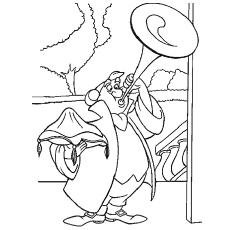 This page is especially good for the younger children for coloring. 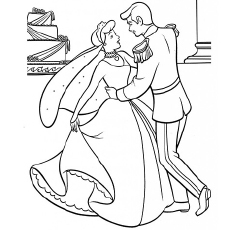 They can color both the prince and Cinderella and get an idea as to how a dancing couple can be drawn and colored. 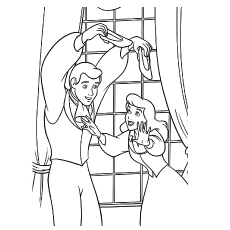 Although only the face of Cinderella is clearly visible while the Prince has his back, the picture certainly will engage your child for hours at a go! 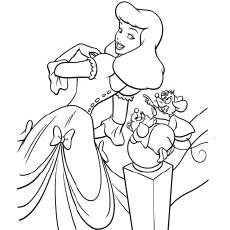 Your lil’ one will surely get a good practice of coloring delicate designs by coloring this Cinderella coloring page. 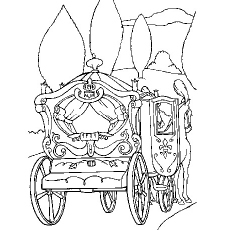 The decorated sidebars are visible in this coloring page too and the children will find it interesting to color the design. 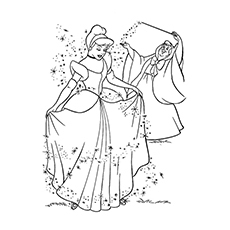 Both the Prince and Cinderella look quite happy with each other and the overall picture exudes happiness and affinity. 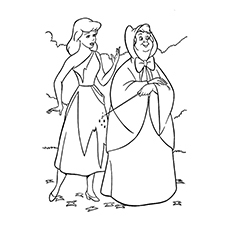 Cinderella is worriedly listening to them and the expressions of anxiety are clear on her face. The expressions of even the footmen look very endearing in this very interesting coloring page. 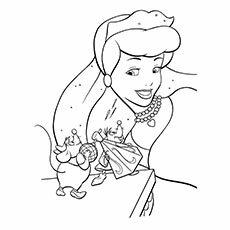 Your will especially have fun coloring the little characters with their anxious look along with the worried Cinderella. The look of anxiety is clearly depicted on her face as she carries her flowing gown and the gorgeous bouquet of flowers with her down the stairs. 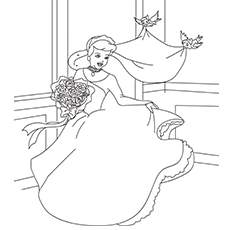 Your child will get to color different objects to color in this one coloring page such as the flower bouquet, the flowing gown, the footmen holding her paraphernalia and the stairs. 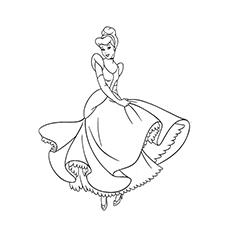 The servant of the Prince is seen announcing that the owner of this glass slipper is going to be identified by matching the glass slipper. The servant has a huge speaker in one hand and a plate on which the glass slipper is kept covered with a cloth, in the other. Cinderella is very happy as her foot exactly fits the glass slipper and the happiness is clearly visible in the picture. 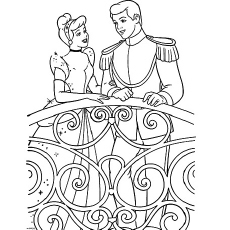 Apart from Cinderella, your child will find coloring the beautifully decorated chair very interesting. The whole picture has a magical touch and that is what children love the most when it is their coloring time. This picture is inspired by the end of the story when the Prince recognizes the girl that came to the party and danced with him. The Square shaped window design will remind your kid about geometrical figures. Also, the picture has drama, happiness and good amount of line work but not very intricate. Your young child will get to use varied colors and combinations in this coloring page, but he will not be confused as the lines are definite and clear.